Having white tigers on display in zoos – an appalling logic? Zoos' mission The mission of modern zoological gardens (zoos) is, or should be, focussed on maintaining global biodiversity – prevent extinction of endangered species – using various instruments. Conservation of wild fauna and flora is one of them. This is done via ex situ conservation efforts with their animal collections and endangered species breeding programmes, and ultimately returning captive bred individuals into the wild. Additionally, in situ conservation is being applied by financing and executing conservation efforts in the field to protect further deterioration of habitats and populations. To support both these types of conservation fundamental and applied research is necessary. All this requires vast amounts of money. Ex situ conservation means literally, "off-site conservation". It is the process of protecting an endangered species of plant or animal outside its natural habitat; for example, by captive breeding programmes or by removing part of the population from a threatened habitat and placing it in a new location, which may be a wild area or within the care of humans. While ex situ conservation comprises some of the oldest and best known conservation methods, it also involves newer, sometimes controversial laboratory methods. In situ conservation is on-site conservation or the conservation of genetic resources in natural populations of plant or animal species, such as forest genetic resources in natural populations of tree species. It is the process of protecting an endangered plant or animal species in its natural habitat, either by protecting or cleaning up the habitat itself, or by defending the species from predators. The source of the money can be governmental and municipal subsidies, sponsors and entry fees. For many zoos the paying visitors are the most important source of money for their conservation work. Therefore, it is important for zoos to attract as many visitors as possible, and have them returning for another visit. Education about nature, endangered species, their habitats and the precarious situation thereof, which is another mission of good zoos, is not enough to maintain a constant flow of revenues by paying visitors. People need to be entertained with other attractions to keep them satisfied. Newborn animals animals attract people, so, many zoos – if not all – advertise their newborns widely. Moreover, people have always been attracted to anything dangerous and/or out of the ordinary – especially when this includes abnormalities, defects and anomalies. So, the critically endangered tiger is many people's favourite in the animal collection of zoological institutions. And when this tiger is more special or rare, it becomes even more interesting. So, a white tiger attracts more visitors, and a white tiger cub even more. Especially when it is advertised as a special and rare species. But to be absolutely clear about this, the white tiger cannot be regarded as rare because it is not a species, not even a subspecies. It is a rare trait, fostered by humans, that's what it is! White tigers White Bengal tigers are genetically aberrant due to a mutation in a specific gene that causes the elimination of pheomelanin expression. Pheomelanin pigment produces the orange colour in normal tigers which means the genetically aberrant tigers are not albinos but are leucistic. This is a recessive trait, meaning that it is only seen in individuals that are homozygous for this mutation. Inbreeding promotes recessive traits and has been used as a strategy to produce white tigers in captivity. Or in other words, the white tiger is a mutant, a freak of nature, an aberration of the Bengal Tiger (Panthera tigris tigris) that has been deliberately 'manufactured' by man. They do occur in the wild, but only rarely. A Bengal tiger with a colour aberration in its coat (white) is not well equipped for hunting in nature, because it lacks camouflage. Therefore it is merely impossible to sustain in the wild. Almost all white tigers are descendants from a lineage of the white tiger found in the jungle of Central India by the Maharadja of Rewa in 1951. As said above it requires severe inbreeding to produce and sustain the mutation of a white coat in tigers. Severe inbreeding also causes a number of other defects in these big cats, such as cross-eyed, club feet, cleft palates, spinal deformities and defective organs. Therefore, in June 2011 the board of directors for the Association of Zoos & Aquariums (AZA) approved a White Paper on breeding of white tigers, white lions or king cheetahs by their member zoos. The paper stated, "Breeding practices that increase the physical expression of single rare alleles (i.e., rare genetic traits) through intentional inbreeding, for example intentional breeding to achieve rare colour-morphs such as white tigers, deer, and alligators, has been clearly linked with various abnormal, debilitating, and, at times, lethal, external and internal conditions and characteristics." AZA-accredited institutions are advised not to engage in intentional inbreeding practices for the purpose of producing anomalous phenotypes from the perspectives of welfare, education, population management, and conservation. White Tigers - Cruelty NOT Conservation. Dysfunctional zoos Zoos that do not invest in conservation efforts and only are interested in increasing their entrance fees, commercially exploit animals with the above mentioned special traits to attract visitors. These zoos do not contribute to nature conservation and can be regarded as dysfunctional zoos. But what about respected zoos that are member of a regional association of zoological institutions? What if they have white tigers on display? What if such a zoo needs the additional revenues, from visitors that come to see the white tigers, to be able to meet the requirements of a modern zoo's mission? Should it be regarded as dysfunctional? Considering that white tigers are not a species, but merely a Bengal tiger with a mutation that impairs their health and survival capabilities in the wild, white tigers have no conservation value whatsoever. So, yes, I would consider every zoo that engage in breeding of white tigers to be dysfunctional. 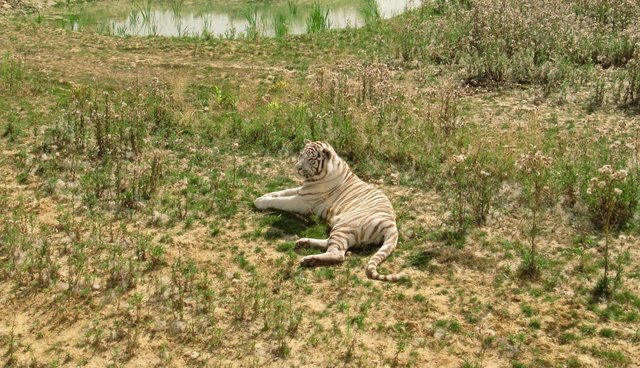 Even, when the zoo itself does not breed them, but only provides a shelter to live out their lives, it sustains the dysfunctional breeding of white tiger. No matter if the zoo tries to use the presence of white tigers in the zoo to educate visitors about the white tiger's abnormalities, the message will still be confusing. "This tiger with its 'abnormal' coat is always a great success with the visitors and yet a lot of nonsense has been said about it! Even if you like this tiger, do spend some time with the other animals which are genuinely endangered because there is no real interest in protecting white tigers as they don't exist in the wild: Man has simply been maintaining a genetic anomaly for the last 60 years!" While the information panel at the enclosure reads: "....these animals are raised within our park only for the pleasure of eyes." So, what do they want to achieve with having white tigers in their park?